The Moomins (Swedish: Mumintroll, Finnish: Muumi) are the central characters in a series of books and a comic strip by Finnish illustrator and writer Tove Jansson, originally published in Swedish by Schildts in Finland. They are a family of trolls who are white, round and furry in appearance, with large snouts that make them resemble hippopotamuses. 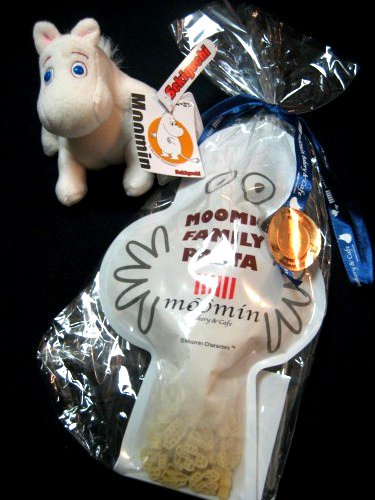 My friend gave me some presents from MOOMIN Bakery & Cafe. 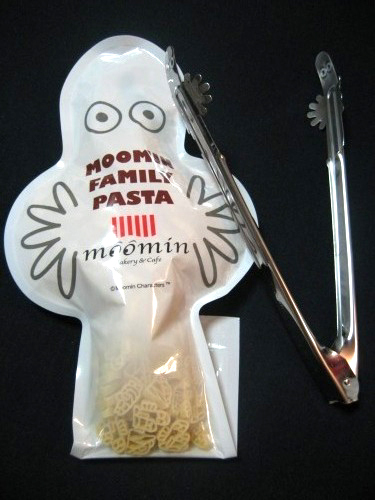 A stuffed Moomin, Moomin family pasta and a spaghetti tong. The pasta and the spaghetti tong are shaped like Hattifatteners which are my favorite character. this coffe shop must be cool! what a luck!